The Nuki App is – like everything regarding Nuki – smart, elegant and easy to use. But that didn’t come out of the blue. In the development process we have encountered many problems and obstacles which have led to some headaches. First and foremost, the different functions of the operating systems from Apple and Google. We want to offer our Nuki fans a consistently nice and comfortable user experience across all operating systems. Hurdles consisting of unfavorable operating system-typical basic behavior, varying GeoFencing, GPS and Bluetooth communication did not bring our developers down – they coped with the challenges and mastered them with great success, ending up with the smartest Nuki App ever. With the Nuki App you can control all Nuki products. 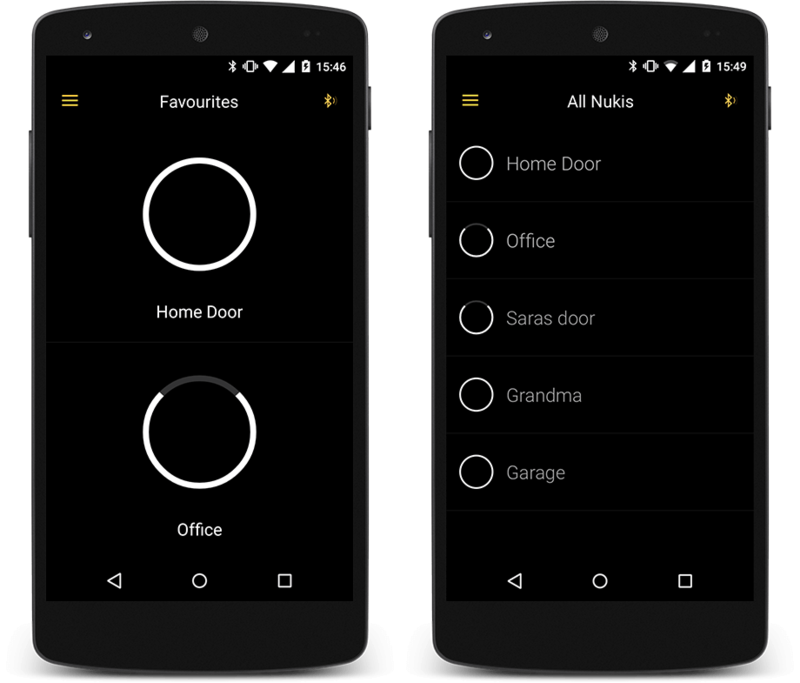 With your smartphone in your pocket Nuki unlocks your door automatically within three seconds. This even works from a distance, if you have a Nuki Bridge that connects your Nuki with the Internet. While this is really practical and of course the whole point of Nuki, you can easily overlook the wonderful App Design on which we have worked so hard. To upgrade your home with Nuki, you mount the Keyturner on your door and install the Nuki App on your smartphone. Then you hold down the button on the Keyturner for five seconds to enter the pairing mode. 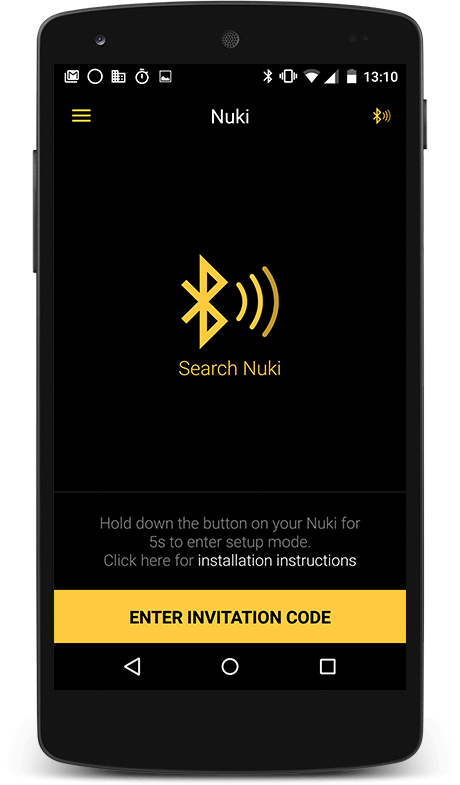 Via Bluetooth the Nuki App automatically finds your Keyturner in pairing mode (and if available the Nuki Bridge too). And that’s it, now your Nuki is ready for some action! 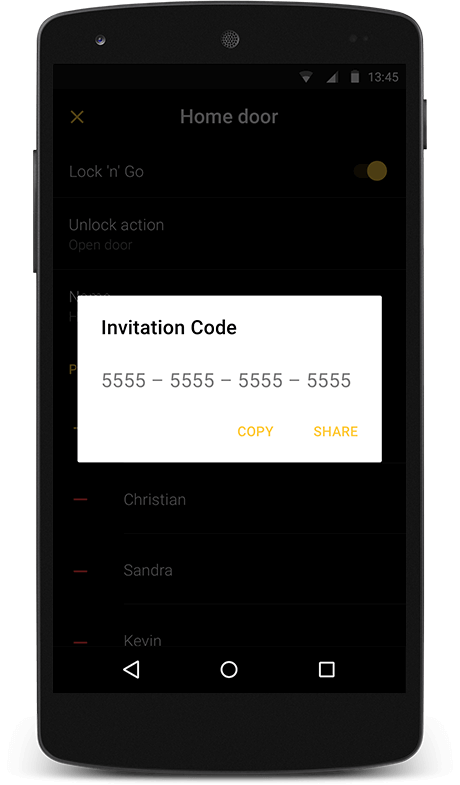 With swipe gestures, which you can configure according to your preferences, you manually lock or unlock your door. Nuki can even pull the lock’s latch and open your door for you, without you having to press down the lever or turn the knob on your door. You’re not a friend of swipe gestures? Tap on the Nuki Screen and choose a button to make your Nuki Keyturner perform a locking operation. In the same way you can also change the settings of your Nuki. All of this at one glance, easy to find. With Nuki you can share an unlimited amount of access permissions with your family and friends. Just send them a Nuki invitation via text message or email and they are ready to go! With the Nuki App you always keep control over the shared permissions and you can withdraw or limit them in time. You want to know who accessed your home? Keep track and check the event log in your Nuki App. You have several Nuki Keyturners at home or have access permissions for the Nukis of friends? No Problem for the Nuki App – manage all of your Nukis at a glance in the list view of the app and operate them directly from there. Furthermore, you can also define your favourite Nukis and access them quickly. You see – the Nuki App is smart, elegant and easy to use. But we are not yet satisfied with that. Of course, we continue to work on making the app more than perfect for our dear Nuki fans. Currently, our developers are working intensely on the safety precautions and overall encryption architecture, in order to optimally protect your Nuki against unwanted access – because we know – safety is the most important thing for your smart home. Once we begin shipping Nuki out into the world, you can download the Nuki App for your Apple iPhone or Android smartphone for free. Unfortunately there will be no Nuki App for Windows Phone users yet, because for the launch we want to fully concentrate on the optimisation of iOS and Android. Finally, we would like to thank you for your great support and your feedback – please continue to let us know about your ideas for making Nuki even smarter! Because we know, only together we can create the best smart door lock of all time – with you, for you. Sign up for the Nuki newsletter to make sure you do not miss any information and stay up to date on the development of Nuki!